Above: A representation of a printed image with print data from the worksheet described in this article. In the previous four parts of this series here at Photofocus, I covered calibrating and profiling, how to use standard test images effectively (especially when viewing images on monitors), the importance of controlling your lighting when evaluating prints, how to do print testing fast and affordably and how to move test images precisely on a page in Photoshop or Photoshop Elements. In this article I will describe how to label prints properly so that you can print consistently and track your print testing over time. The reason why you should take notes indicating the settings used to create prints is because there are so many options available when doing print testing (especially with inkjet printers). It’s easy to press a few buttons, make a great test print of a standard image or one of your photos, and then forget what combination of settings got you there. By labeling your prints using a printed form with various details, you can easily recreate the steps you took to make the prints, and it’s also a great way to test a few different options and then compare them side by side. Some examples of the details provided in the worksheet linked to below include: Date of Test; File Name; Printer Name; Paper Name; Printer Profile used; and Rendering Intent. Other info can also be added, such as the options provided in printer drivers like “Finest Detail” or “High Speed,” or in applications that allow options such as “output sharpening,” like Photoshop Lightroom 2 and 3. 1. Print the worksheet on lightweight paper, cut out a section, and use a glue stick or tape to adhere a test block to the bottom or back of a test print after printing each test image. Then fill in the information that pertains to your situation. If you plan to make multiple prints on one sheet as I described in Step 3, this may not be the best method because you can get printhead strikes if the paper sticks up on one or more of the edges. 2. Print the worksheet on letter-size (8.5×11-inch) crack and peel adhesive label sheets, then cut them out and affix them to your prints. This can help avoid the potential printhead strike problem. 3. Keep the labels in sheet form (instead of cutting them out), fill out the information, and just write a reference number on the sheet and your prints. 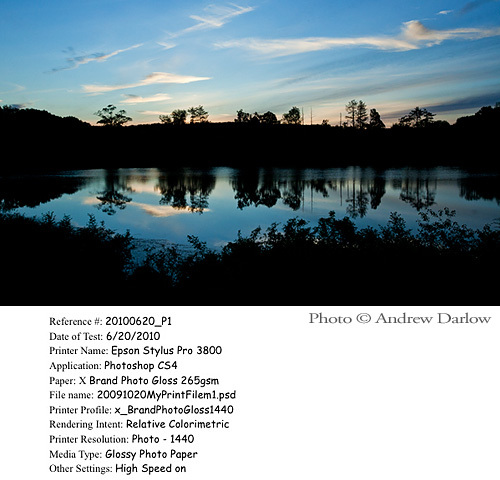 In the example shown above, you would just write: “20100620_P1” on the actual print. That represents June 20, 2010 and Print 1. That can avoid potential problems with the label potentially coming off inside the printer. Just be sure to store the reference sheet with the prints, or keep them in a safe place. 4. You can just write out the print information using the print form as a reference for what parameters you want to use. 5. You can also print the list of parameters out when you print your images. To do that, just crop out a section from the form and add it to your document. Then just fill in the print information. You can even type out all the print information before you make the print and add it to the bottom or side of the print. You can save the text as a layer in Photoshop or in a text editor to save time. In this article, I chose to show a type of image (a landscape with gradients and deep blue colors) that can print very differently just by changing one or two settings, such as Printer Resolution or Rendering Intent. When doing print testing, I recommend starting with some of the standard test images that I discussed and linked to in Part 4 of this series. To sum things up, if a standard image looks like it should on your calibrated and profiled screen, and if it looks like it should when printed and viewed under proper lighting, then there is a very good chance that your images will match (or come very close to matching) your screen as well.